contribution of Mr. and Mrs.
every member of every family. Friday, March 20. He was 95.
contributor to the Joseph L.
member of Temple Beth El. munal and cultural life, Mr.
ths to complete the task. dent. Sheila Engelstein is Women's Division President. Super Sunday '84 broadcast live on WPTV, Channel 5. Director of Communications, at the Federation office, 832-2120.
at the Hyatt Palm Beaches. Creating An Alternative To Death And Taxes? your community and your world. of Palm Beach County, 832-2120.
? I have already provided for the Endowment Fund in my will. D I intend to make a gift to the Endowment Fund in my will.
? I intend to make a gift of real estate, securities, or other property. D I intend to designate the Endowment Fund as the beneficiary of a life insurance policy. D I intend to establish a trust and/or foundation with the Endowment Fund as beneficiary. Please call and discuss with me the items I have checked above. ? Please mail to: Endowment Fund of the Jewish Federation of Palm Beach County, 501 South Flagler Drive. Christians participated in the Damascus talks. Although President Gemayel condemned the Syrian in- ? volvement as "illegal" and "unconstitutional" the central ? bollah will maintain an accommodation with Syria. Israeli backed South Lebanese Army. ijij toward the Lebanese coast to intervene militarily. Combining "Our Vote*" and "Federation Report at"
POSTMASTER: Send address changes to Tha Jewish Floridian. 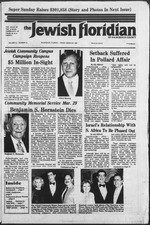 Combined Jawiah Appeal Jewish Federation of Palm aaach County, Inc., Otlicer. Preaidem. Director of Public Relations, S01 South Flagler Dr., Weat Palm Beach, FL 33401. Federation of Palm Beach County, S01 S Flagler Dr.. Weat Palm Beach, Fia. 33401 Phone 832 2120.
ings in six weeks time. the mouths of the corpses? - 832-0804; Monday, April 13. The mtervtewer w.ll nol know, and w.ll not .sk for. your name or addres..! Sidney Berger, Chairman of the event. service to the community are Claire Klein, Larry Ochstein, Robert D.
Rapaport, Bonnie Silverstein, and Fran Witt. Free Sons of Israel -12:30 p.m.
retreat 9:30 a.m. to 4 p.m.
p.m. Na'Amat USA Sharon -election of officers. 10 a.m. Hadassah Henrietta Szold board 1 p.m. ;! ; noon N'Amat USA Council fundraising workshop. Zelda Pincourt, Rose Lord, and Helen Levine. Dance Qo Cam Tripe ftoeer-Skating. COACH J I. M0NT60MERY. C.C.O. "Fad the personal touch cf professionals with 30 years of experience." Escape 16 A FkiENDUER Climate. Don't let the Florida heat get to you! the Fallsview activities even more. three sumptuous meals a day. atmosphere is as inviting as the weather. The "Wedding of the Year"
meal, on a shift system. ship in Calcutta in 1975.
taxed King Solomon the Wise. fields to be "no man's land,"
instead of the imported ones. ground into a cocoa-like flour. sulking in a corner all day. definitely to cover such cost. recruited to volunteer at the phonathon. .Mix eggs. oil. 1 packet G Washington* and pepper Gradually add matzah meal. in a completely Sabbath and Yom Tov observing hotel. A special meal for a special time. and excellence (and Empire's standards for great taste). of Empire...and feast on the compliments. THE MOST TRUSTED NAME IN KOSHER FOODS. the question to be asked. highlighted by a fashion show. Were not just good,were nice. 250 Publix stores throughout the state. Wfcte not just good, iveYe nice. Other CD cash bonuses now available. Call 1-800-FLAGLER for more information. locally, in Israel and around the world. Mrs.
Women's Division President; and Robert Fitterman. Division Campaign Vice President; and Lionel Greenbaum. Richard and Robin Bernstein with Mr.
humanity and the Jewish people. debate to reach its decisions. makes war there more likely"
Lunch, dinner, show and games are included. contact Donor Chairman, Myra Ohrenstine. Gate of Century Village on Okeechobee Blvd. the memorial service. Refreshments will be served. live longer." Dr. Aisoirom_wHl_answer questions. ty, will talk on "Plight of the Refuseniks." Sandy Reisman, and Ursula Gutterman. Sam Holtzman, and Fred Axelrod. hdence to make an arrest. t to the State of Israel. with 15c off, the rich get richer. on any size bottle of Sunsweet. when mailed to Sunsweet Prune Juice. Dept *S902. f / Paso. staff are helpful and gracious. plan exciting events for the future. the complimentary buffet. Donation $1 plus your own fare. our group at the door. Day at Jerry's home. Drinks and munchies will be provided. Donation: $3. For location and directions call the JCC. p.m., to plan events for the upcoming months. : Turnpike). Donation: $1 plus own fare. f. For more information call the JCC at 689-7700. Classes on Fridays at 1:30 p.m. Wisdom of the Body Series. Thursday, April 2 at 2 p.m.
must be made by April 15. Legal Unit of B'nai B'rith No. These programs are open to all Jewish teens and parents. to TALK and LISTEN to one another. How Can We Understand Each Other Better"
services 8 a.m. Sabbath services Friday 8:15 p.m. Saturday 9 a.m.
Howard Dardashti. Services Monday and Thursday, 8:16 a.m.
Palm Beach 33417. Phone 686-5056. Sabbath services 8:45 a.m.
son will chant the kiddush. Award from the North Friday, March 27, 7:30 p.m.
vices will begin at 10:30 a.m.
grow in numbers and quality. to sing at evening service. JHL March 27 6:17 p.m.
Anna, 76, of Century VL. Purity Plan Chape], West Palm Beach. it is not legally bound to do so. Tsur, a former Chief of Staff. funeral chapel in one convenient location. homes lined the lush fairways of the worlds finest golf courses. An unforgettable era whose time has come again. to be, is the way it is. Come, relive the tradition.